The Klotzbach et al paper (previous here) is finally published, and seems to have kicked off something of a blogstorm again. As you may recall, when the preprint was first publicised, Gavin Schmidt quickly identified an error in the analysis. The paper looks at the difference in trend between surface and troposphere, and the claim that this points to some previously-unexplained factor (which they ascribe to "bias" in the surface measurements, see below) depends on the "expected" amplification factor of 1.2 which is derived from models. As Gavin pointed out, however, the factor of 1.2 does not apply over land (his model's ratio is 0.95) which eliminated half of their effect at a stroke. K09 originally appeared to accept this (see table in blog post) so it was surprising to see that they hadn't bothered to correct this for the final version of the paper. They made several other changes later than that exchange, so it's not like they didn't have the opportunity. K09 have now replied by claiming that Gavin's correction isn't correct after all, and they "understand" from McKitrick that the original 1.2 value is appropriate for the region they were considering. It is odd enough that they didn't clarify this in the paper, but what is even more bizarre is their repeated claim the different values don't matter, since clearly Gavin's value knocks off half of the claimed discrepancy at a stroke. Ross McKitrick seems pretty embarrassed by the whole affair. All he did was write an informal email to one of the authors, which he never intended to be made public, and he seems to have been as astonished as Gavin was to find his calculations used as the basis for the analysis in K09. He thinks it was inappropriate for them to have used his numbers, which he now acknowledges are incorrect. His new values are contradicted by Gavin's, and I know who I'd place my money on (McKitrick's numbers imply a global mean factor of about 1.45, far higher than the generally accepted figure, and he's had difficulties with such complex issues as area-weighting in the past). But irrespective of the numbers themselves, it is staggering that K09, having been alerted to the problem by Gavin, didn't bother to check for themselves, preferring to publish the disputed values first and correct (or not) later. Of course this "see no evil" strategy means they have made McKitrick look stupid for the error, and whatever you feel about his contribution to climate science in general it's hard to not feel some sympathy for him in this case. It is shameful of K09 to hide behind McKitrick in this way rather than performing the calculation themselves if they won't accept Gavin's figures. Distinct from the dispute over those numbers, there are some more rather amusing changes to the paper, in that the interpretation of the Lin et al 2007 results has been reversed. Originally (and repeatedly) touted as supporting the hypothesis of Pielke and Matsui 2005 (and don't forget that Pielke and Matsui were co-authors on L07), it was noted by Urs Neu out that this interpretation of the analysis was based on a sign error. When correctly interpreted, the L07 results actually oppose the PM05 hypothesis, which at a minimum demonstrates that if the PM05 effect really existed, it is not large compared to other local influences. This was documented in Lin et al. who found from observational data that monitoring long-term near-surface daily minimum temperature trends at a single level on light wind nights will not produce the same trends as for long-term temperature trends at other heights near the surface. For instance, were the data from Lin et al. to be representative of biases in other station measurements taken at one height, then about 30% of the tropospheric warming during the 20th century reported by the IPCC would be explained as the result of this factor. A warm bias would occur even for daytime maximum temperatures for land locations at high latitudes during the winter when the surface temperature profile remains stably stratified all day. This was documented in Lin et al. who found from observational data that monitoring long-term near-surface daily minimum temperature trends at a single level on light wind nights will not produce the same trends as for long-term temperature trends at other heights near the surface. For instance, were the data from Lin et al. to be representative of biases in other station measurements taken at one height, then the tropospheric warming during the 20th century reported by the IPCC would be underestimated by about 30% as the result of this factor. A cold bias would occur even for daytime maximum temperatures for land locations at high latitudes during the winter when the surface temperature profile remains stably stratified all day. This was documented by Lin et al. who found from observational data that monitoring long-term near-surface daily minimum temperature trends at a single level on light wind nights will not produce the same trends as for long-term temperature trends at other heights near the surface (although it was a cool bias in that data for the time period and location examined). A warm bias could occur even for daytime maximum temperatures for land locations at high latitudes during the winter when the surface temperature profile remains stably stratified all day. Funny how this inconvenient result is now relegated to a "time period and location examined" when it was previously hypothesised to be representative of the global picture. There were no fewer than three other places where L07 was originally cited as being consistent with the K09/PM05 hypothesis, but it would obviously have been too painful for them to mention that their own observations of boundary layer lapse rates contradict their theory. Therefore, these statements have just been deleted. It is particularly curious that the contribution of Urs Neu (who corrected this sign error) is nowhere acknowledged. Perhaps he requested that his name was not mentioned, but otherwise this omission sits uncomfortably with (in particular) RPJr's willingness to throw accusations of plagiarism around at others. Yet another error is the repeated mis-attribution of comments from Santer et al (2000) as coming from Santer et al (2005). The significance of this is that back in 2000, there was still a rather large discrepancy between satellite observations (and specifically between the UAH analysis and the expected tropospheric amplification), for which people put a lot of effort in to trying to think up plausible explanations. Of course a large part of this discrepancy was fixed, when it was discovered that another sign error in the UAH analysis had understated the trend (BTW, anyone notice a pattern here? ), largely reconciling the problem. By giving the wrong reference, K09 gives the wholly misleading impression that many scientists in 2005 disagreed with this reconciliation. In fact, Santer et al 2005 (and accompanying papers) was this reconciliation! So it seems we have a hypothesis about a significant decrease in lapse rates in the boundary layer which even were it true, has no real impact on predictions of climate change but anyway is (a) not supported by any theoretical calculations (since the PM05 calculation is simply inapplicable), and (b) actually opposed by the observational evidence on lapse rates that the proponents themselves have analysed (as L07 had a sign error). It seems that only one thing has remained a constant amongst the blizzard of errors and bluster, and that is Roger Pielke Sr's unshakeable beliefs that the surface temperature record is wrong, and that the fact that his nonsensical "research" on this has been ignored by the scientific community is evidence of some conspiracy to cover it all up. Perhaps this is what "Pielke Climate Science" means. I prefer the traditional approach. Roger seems to claim that the model expected amplification factor doesn't matter for the paper's conclusions. Do I read your post correctly in that you think that is, uhm, not true? I suspect Roger may be playing semantic games again. Certainly the factor is critical in establishing whether or not there is some unexplained "divergence" between the observed land surface and tropospheric measurements. However he may be simply trying to say that even using Gavin's 0.95 value, there is still some gap there, albeit it is half the size that they claim in the paper. Publication of a paper with Bill Gray's post-doc, the mistake-prone John Christy and not just one but both Pielkes as co-authors must be a singular event in the history of climate science. Indeed, doesn't physics require the formation of a singularity in the vicinity of such a degree of density? Where in the paper does it support RP jr's claim about the "region" they were studying corresponding to McKitrick's analysis? As far as I can tell, the data comparisons were based on the standard global, land-masked and ocean-masked products for each data set. Also, at the risk of repeating myself, the so-called "bias" is not only greatly reduced over land when the proper amplification is used, but the discrepancies are not clearly distinguishable from those over ocean. Indeed incorporation of the correct amplification factors shows better agreement bewteen HadCru and satellite records over land than over ocean, in apparent contradiction of the guiding hypothesis. As implied in my previous coment, McKitrick's numbers are based on a small sample subset used in Gavin's IJOC article (itself a response to previous work by McKitrick). So they may well be correct for that subset, but are in no way applicable to a general analysis. And even then the difference between land and ocean is just as staggering. You'd get better agreement between HadCRU and satellites over land than over ocean, even using McKitrick's inflated figures. This report (WUWT link warning) shows what John Christy gets up to in front of a home-town audience (in Huntsville, Alabama). Note that Andy Revkin says he continues to use Christy as a major source for comments on breaking climate news since other climate scientists continue to legitimate Christy, in particular by appointing him to various committees. Possibly that's a habit that should be broken. "He thinks it was inappropriate for them to have used his numbers, which he now acknowledges are incorrect. His new values are contradicted by Gavin's, and I know who I'd place my money on..."
Actually, what McKitrick wrote was that Gavin had made the error and then corrected it. Right? McKitrick's original subset could be considered a subset of the CRU land mask. But it contains a lot of island and coastal stations and omits large swathes of interior grid-cells (judging from the map in the archive). 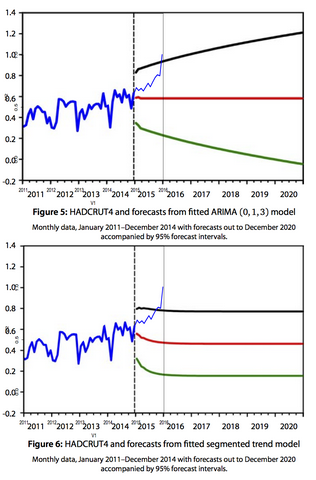 So McKitrick's original estimate of the "land amplification" factor was definitely too high. Gavin's factors were based on the whole set of model grid cells, but used the model masks to separate land and ocean. I gather the model land and ocean masks are not the same as the "real" world masks wrt islands and coast lines. McKitrick then took the sub-sample and divided it into land and ocean according to the model mask, rather than considering it all land. But it's still a severely restricted unrepresentative sub-sample. To me the fundamental flaw in K09 is that it assumes the same expected amplification factor over land and ocean. Once that assumption is removed, the analysis falls apart, irrespective of the exact amplification factors used. But I agree with James - Gavin's numbers are much more likely to be realistic, as they are based on the entire globe. The only caveat is that the masks used in the observations data sets are not exactly the same as in the model. And they may not be calculated or weighted in the same way even comparing, say, the two surface data sets. In fact, this might account for some of the differences between land and ocean trends which vary substantially in the various observational data sets. Predictably, and most disappointingly, RPSr. has responded with his usual harrumphing harrumphs. I see he's even thrown in a sneaky ad hom (or two) for you. Tsk Tsk. All agree that the 1.2 number is wrong, regardless of who you blame for the mistake, and McKitrick is absolutely explicit that he did not give permission for the contents of his private email (as it was) to be published. I'm sure you have read his open letter on the matter. Yes, it seems that Gavin got something wrong in the supplementary info to the IJOC paper, but that hardly excuses K09's behaviour. Never one to let a good line go to waste, sometime ago Eli described Roger Sr.'s modus operandi as donning the harumphing regalia and letting loose. My point here is that you took a swipe at McKitrick as being incompetent and then link to his post where he explains that Gavin made the mistake, admitted it, and corrected it. I know how to read. Strike 1 - There is no evidence that Gavin Schmidt's correction affects in any way the calculation of amplification factor. So that's a red herring, absent any specific info to the contrary. Strike 2 - McKitrick's recalculation still uses a very restricted biased sub-sample. That's why his calculation is different (and wrong). Strike 3 - IIRC, Schmidt archived all the model surface and synthetic MSU data, or at least made it available. Yet neither McKitrick nor K et al have availed themselves of that data to calculate the amplification factors themselves. Or, even better, apply the model masks to the observational data, for a true "apples-to-apples" comparison. If anything, James is being overly kind to McKitrick. On top of everything else, it appears that mention of the correction was designed to give a misleading impression that McKitrick's calculation was a correction of Schmidt's. As I've explained above, that is not the case. Tom C, you've been had. small by a constant factor of 0.7188 due to an error in how missing data was dealt with (the constant factor was particular to the number of years read in vs. the number of years used in the calculation). Obviously if the trends were affected by a constant factor, there would be no effect on the ratio of trends (a.k.a. expected amplification factor). A logical dodge a 12 year old could spot? Why even bother. "Thus, James is still admitting that a discrepancy remains." Indeed I am. It remains to be seen how significant it is, and what it its cause. I would not wager against a substantial part of it being due to unresolved errors in the satellite data, which has quite a history of these sort of things. Of course I don't expect the models to be perfect either. As for the surface obs...well there could even be something there too. However, whatever it is, it is not the issue raised in PM05, because those calculations were essentially bogus. Now there's an over-generous reading. Of course RP Sr. means the discrepancy he claimed for the reasons he claimed it. Well I'll leave him to his private fantasies...but it seems to me there *is* still some discrepancy in the general sense (independent of K09), and the obvious sense of relief at the 2005-6 "reconciliation" has been somewhat overstated IMO. But this is at the level of fine detail and not a big looming problem that overshadows all of climate science. "...I would not wager against a substantial part of it being due to unresolved errors in the satellite data.."
That makes no sense in light of the Radiosonde data which for the most part is cooler than TLTs, making the amplification error even worse in the models. It also makes no sense since it appears to favour the surface station data over the superior spatial coverage of the MSU data. If the surface data are right (and Pielke Sr. is wrong) and the TLT data are right, then the models have a big problem. The issue is not spatial coverage but interpretation and processing of the remote obs. Changing the subject a little, but of some relevance, I recently saw a comparison of a model's cloud field, together with the simulation of what some cloud-observing satellite observations of this field would be processed into. There was some similarity in the patterns, but also large differences, including a substantial mean bias. And that's in the best case where there are no timing and calibration errors in the actual instruments. Satellites don't give you the "temperature" or "cloudiness" or anything like that, they (generally) give you radiation measurements in particular wave bands, which requires substantial interpretation. The difference between UAH and RSS is large compared to that between different surface analyses. The sonde data is generally thought to be the worst of the lot, Klapper, and my impression is that it remains unclear that the satellite data-splicing has been perfected, which is why the modelers are happy enough to have things in the ballpark. As James says, the reconcilation of a few years ago did get overstated, but that was an understandable response to the denialist squawking that had arisen from an issue that was never more than a molehill to begin with. Yes, there is still a discrepancy between actual and expected amplification to be explained. Paradoxically though UAH and RSS are closer now than they were in AR4 (where RSS LT was at 0.19C/decade and UAH only 0.12C/decade). Globally, it's true that the surface series are much closer than satellite. But when you break it down over land and ocean, NCDC and HadCRU are very different. NCDC shows much faster warming over land, but less over ocean, when compared to HadCRU. The RSS-UAH differences are more consistent. So there are discrepancies in the surface record too. But I agree the satellite record is likely to have the greater unresolved problems. There's that pesky annual cycle (present in both, but more so in UAH), that probably reflects difficulties in correcting and splicing the satellite record. "...and my impression is that it remains unclear that the satellite data-splicing has been perfected..."
Doesn't that issue apply in spades to the surface record? Stations move, and the environment changes around stations even when they don't move. At least when they move you you know you have to merge the trends, but unlike the satellites the environmental changes in between "moves" can be unpredictable and abrupt (compared to say orbital drift which would be the equivalent "environment" change for a satellite). I take it we can at least agree the satellites have much superior spatial coverage?